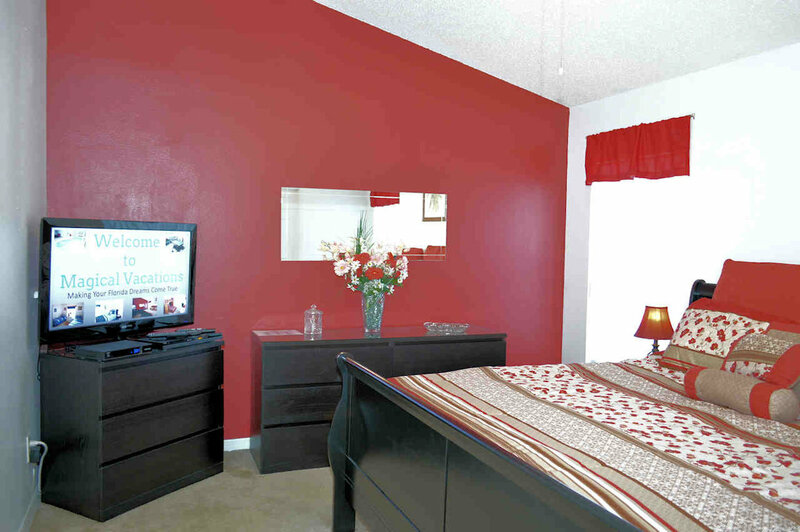 Welcome to Our Fantastic Home - Making your dreams come true. Our recently redecorated, high quality, 4 bedroom (2 en-suite) villa has everything you need for a relaxing vacation. 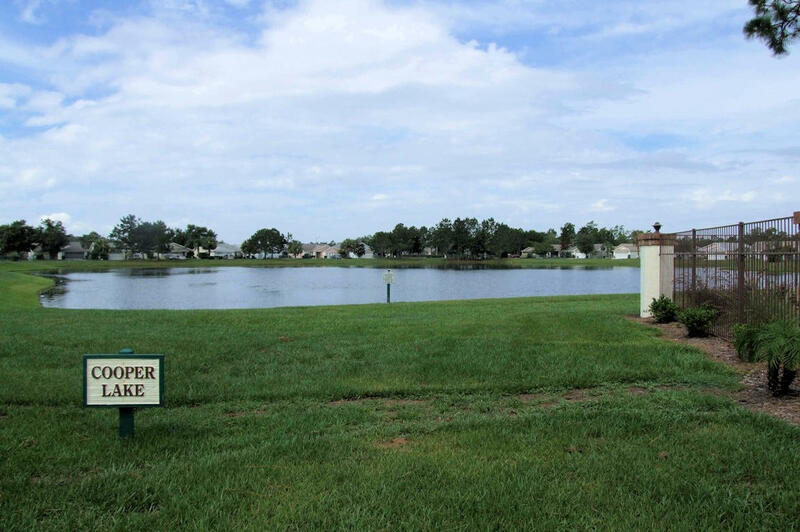 The villa is located on a quiet road within Indian Point, a prestigious community located just off US192 in the Kissimmee area. 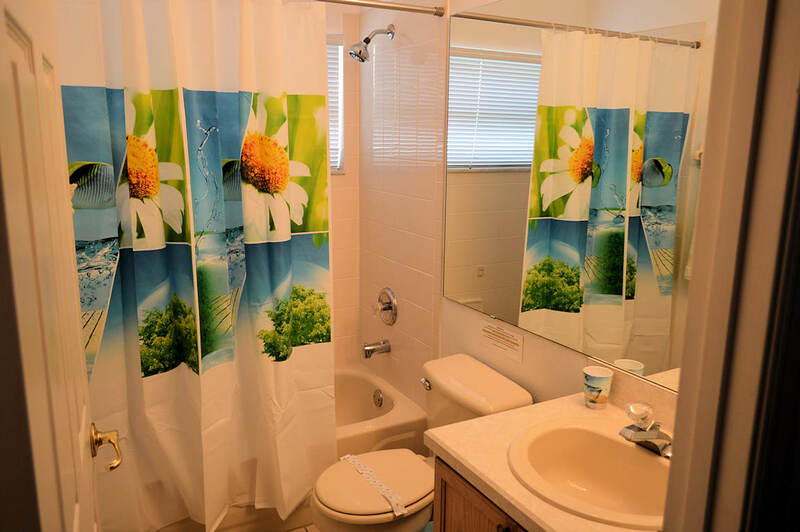 It is in an ideal location for the Walt Disney World Resort (10 minutes), Sea World & Universal Resort (20 minutes) and the many other major attractions that Central Florida has to offer. 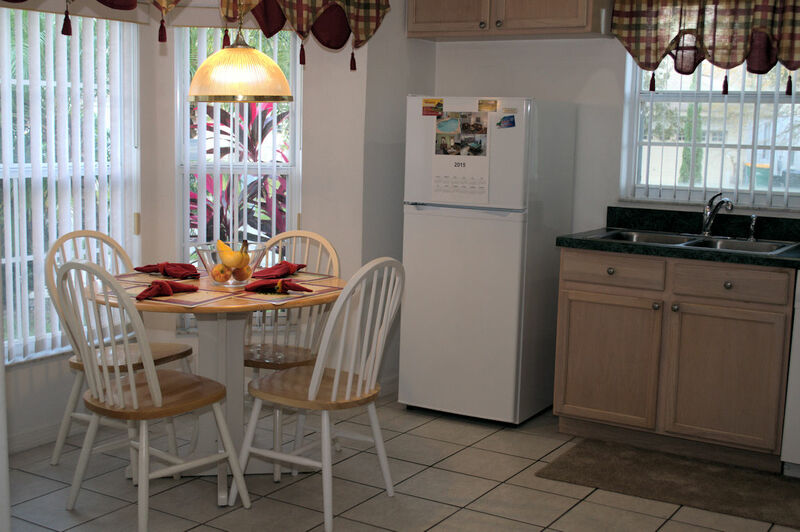 The villa is family-owned and cared for, complete with all you need to enjoy a perfect vacation. Our management company will contact you to answer any queries you may have and they are also available 24/7 should any emergencies arise. Orlando is a shoppers dream with its many malls and factory outlets. 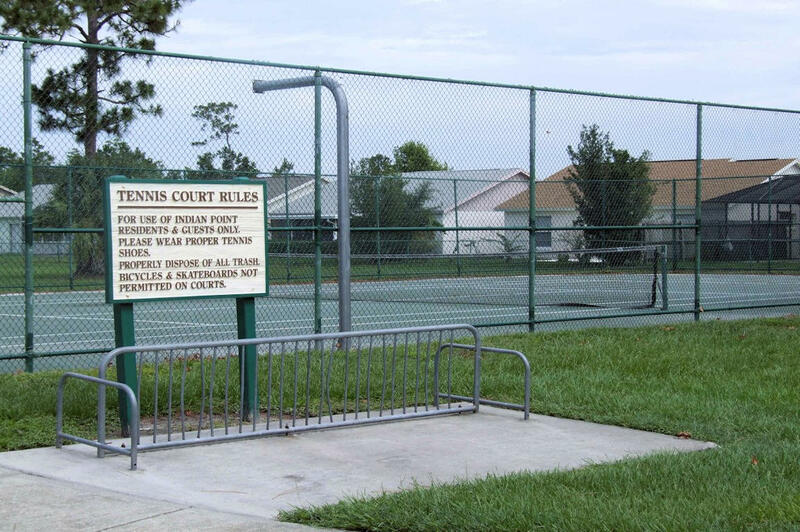 International Drive is only a short drive away as are the majority of the shopping malls. Local flea markets offer reasonably priced luggage - an extra case may be needed for all your bargains. Shopping for groceries and other essentials is also within easy reach, Wal-Mart (2 minutes), Target and Publix are all nearby on the 192. The 192 is home for so many restaurants that you will never be short on choice for dining out or ordering in. A number of Dinner Shows are also within easy reach, e.g. Medieval Times (3 minutes), Capone's and Arabian Nights. For entertainment, a number of Go-Kart Tracks, Adventure Golf and Mini-golf courses line the 192. Look out for the neon lights of Old Town with fairground attractions and bungee rides. It features a parade of lovingly restored and maintained cars every Saturday night. 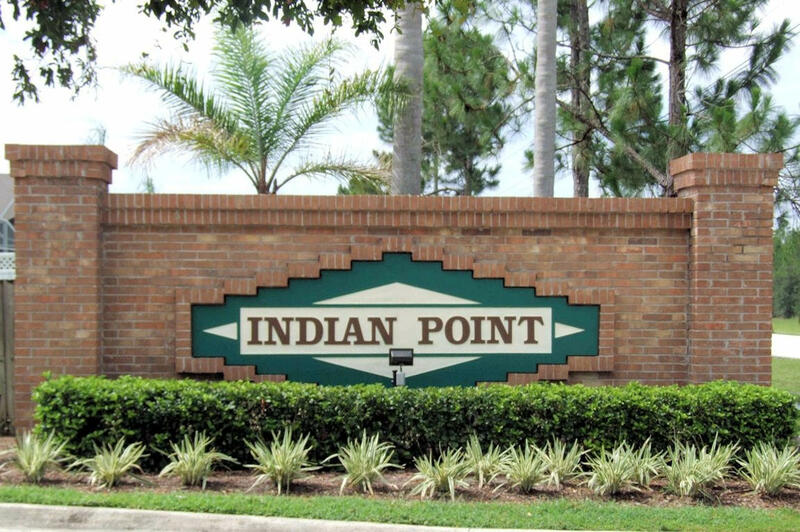 Closer to home, Indian Point boasts a swimming pool, tennis courts, children's play area and a large lake. Into golf? You'll think you're in paradise with more golf courses than you can shake a stick at! Most offer Club, Buggy and Shoe Rental. We also provide full sets of Gent's and Ladies golf clubs for your use. 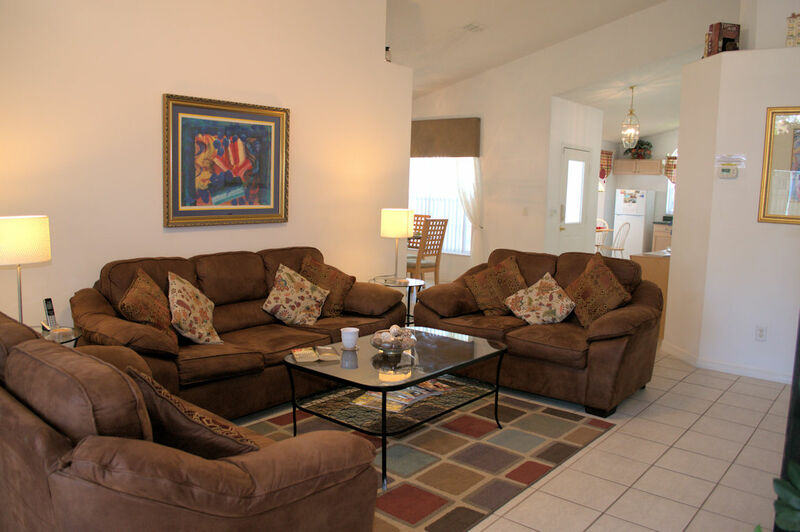 The living area, or great room, is a large open space with plenty of room for relaxing after a day in the parks. 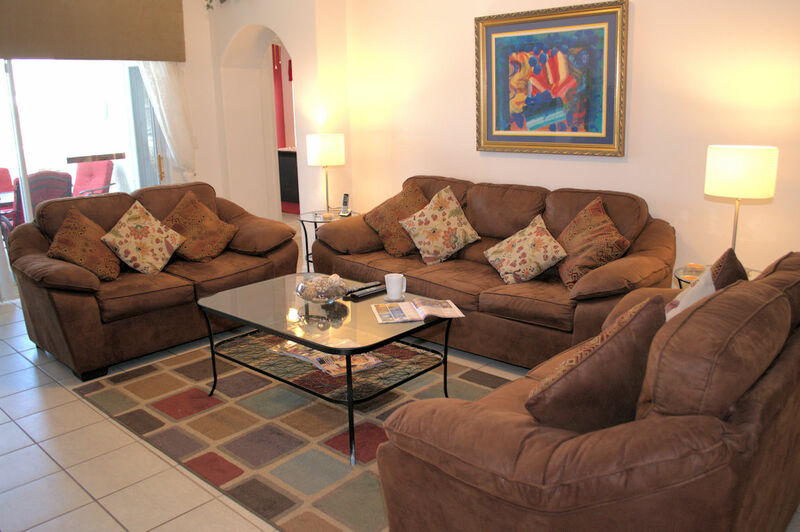 Our's consists of a large 3 seater, queen sleeper, sofa and two large 2 seater sofas, along with a coffee table and two side tables with lamps (all new in November 2013). A cordless telephone rests on one of the side tables. The entertainment centre contains a 55" 4K Ultra HD SMART Television with 100's of digital cable channels, a Blu-Ray/DVD player and a stereo system. Bring your Login ID for access to Netflix/VUDU or other streaming services. There is also a large library of books, DVDs, CDs and games for your enjoyment. 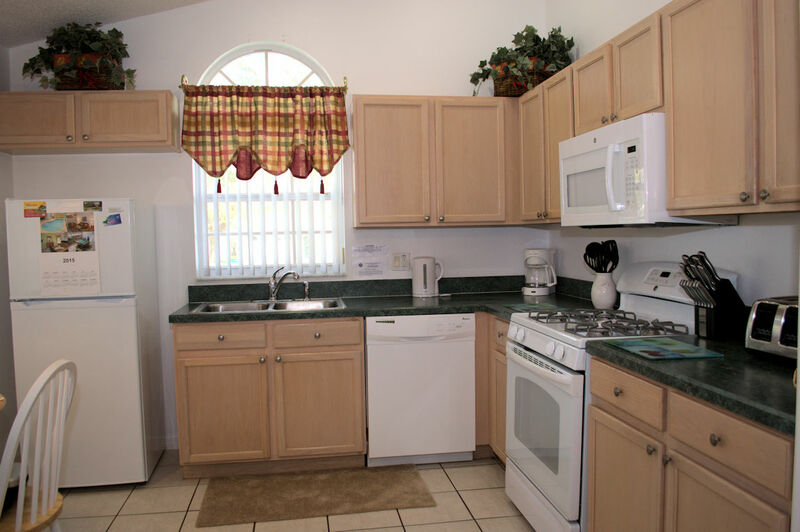 The kitchen is fully fitted with everything you need. 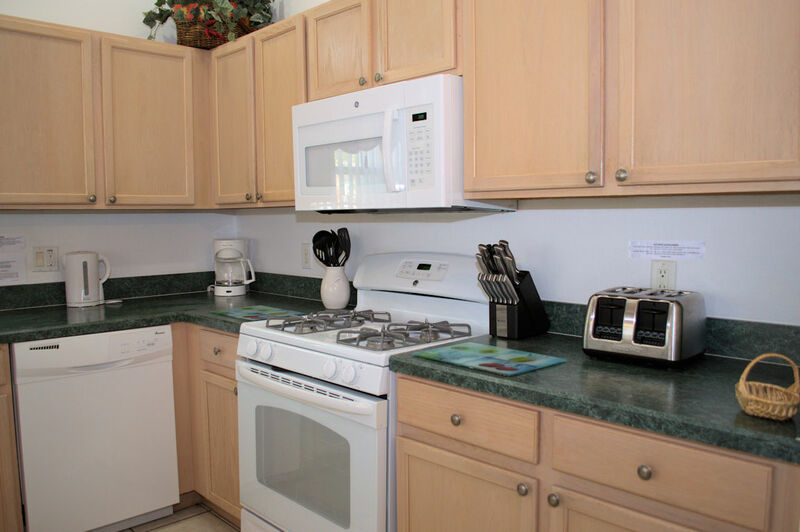 There is a large gas stove, microwave, fridge freezer, dishwasher (all new in December 2013), kettle, toaster and coffee maker. There is also a breakfast nook with table and four chairs, plus a telephone. 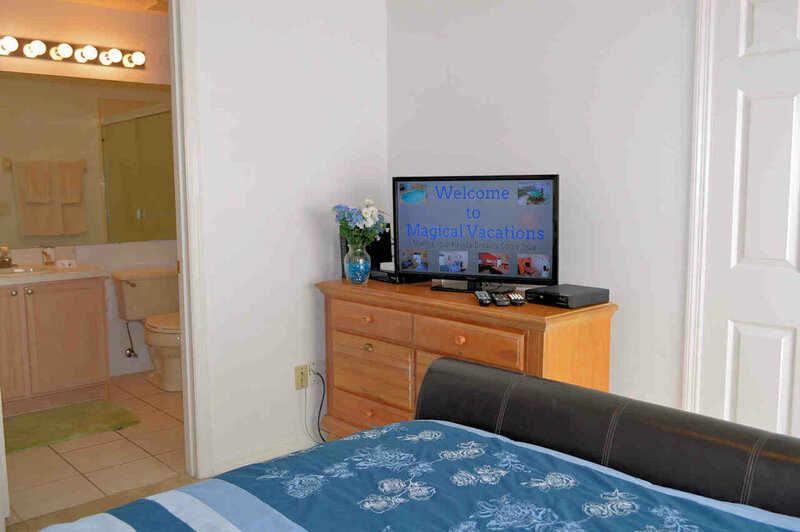 There are four very good sized bedrooms all equipped with flat-screen LCD digital cable TV's and DVD players. 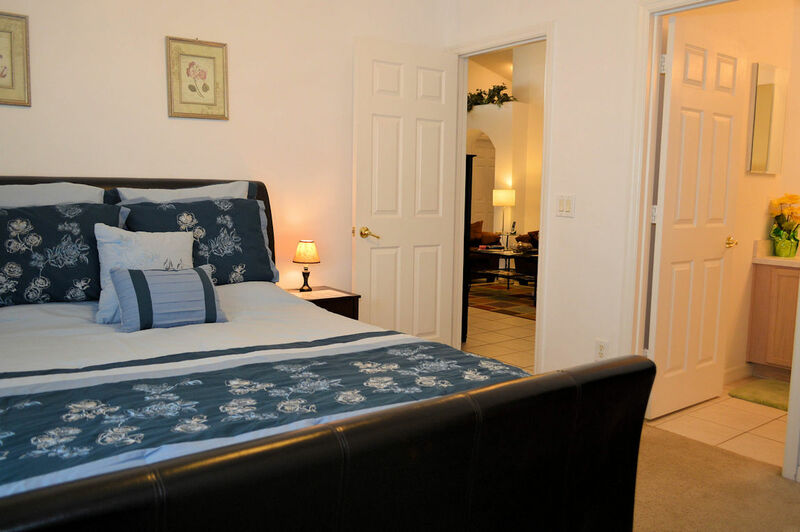 The first master bedroom has a king sized bed, cordless telephone, ceiling fan and two nightstands with table lamps. TV recently upgraded to 40" with Roku Streaming Service. 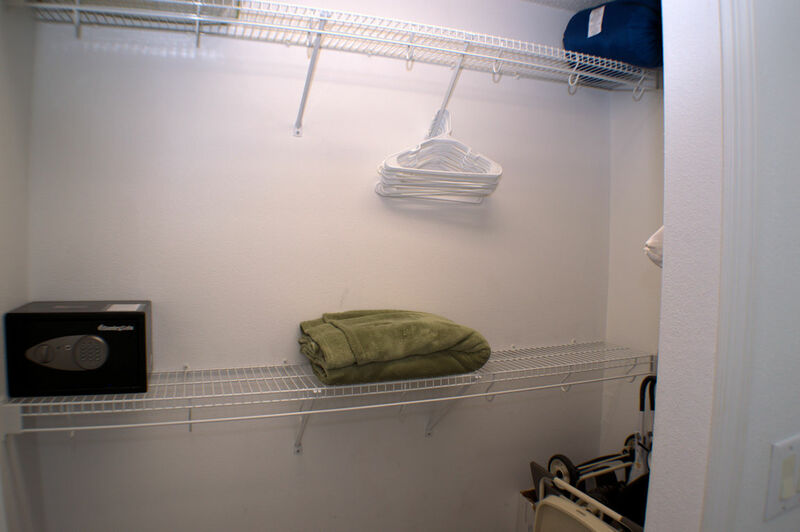 A walk-in closet gives plenty of hanging space and is home for the safe for your valuables. 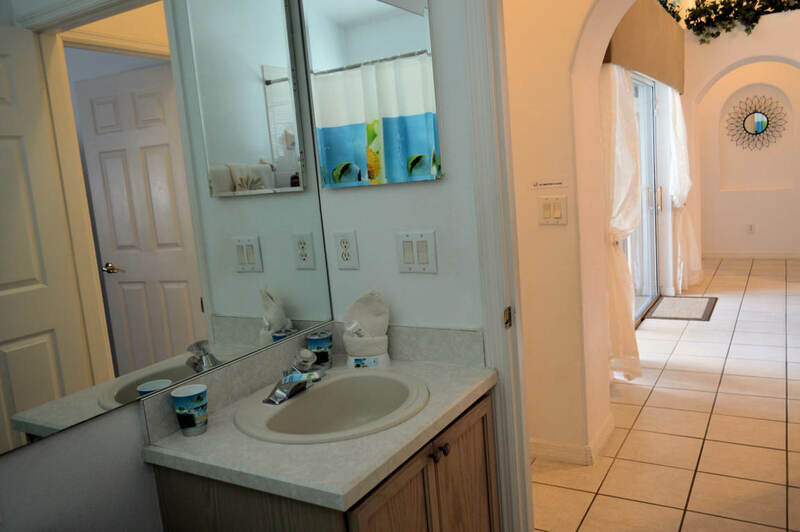 It has its own en-suite bathroom consisting of a large corner bath, walk-in shower, his and hers vanity unit and a toilet behind a privacy wall. 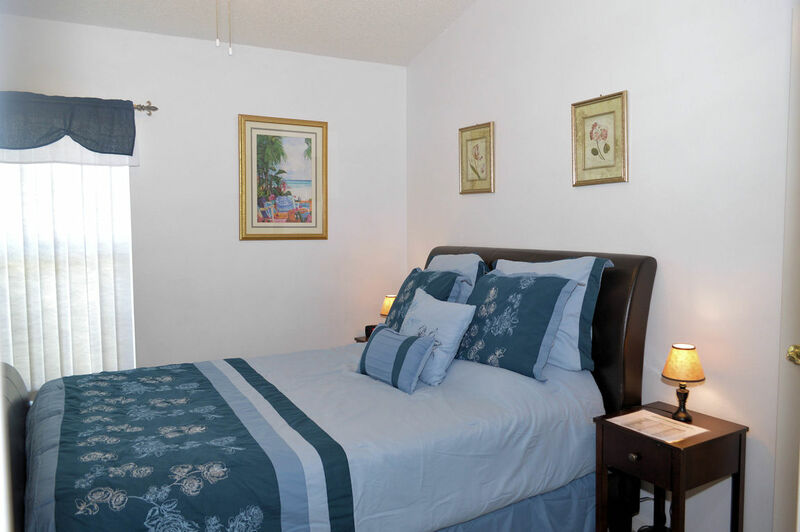 The second master bedroom has a queen sized sleigh bed and two nightstands with table lamps. TV recently upgraded to 32" Flat-screen with Roku Streaming Service. A walk-in closet gives plenty of hanging space. 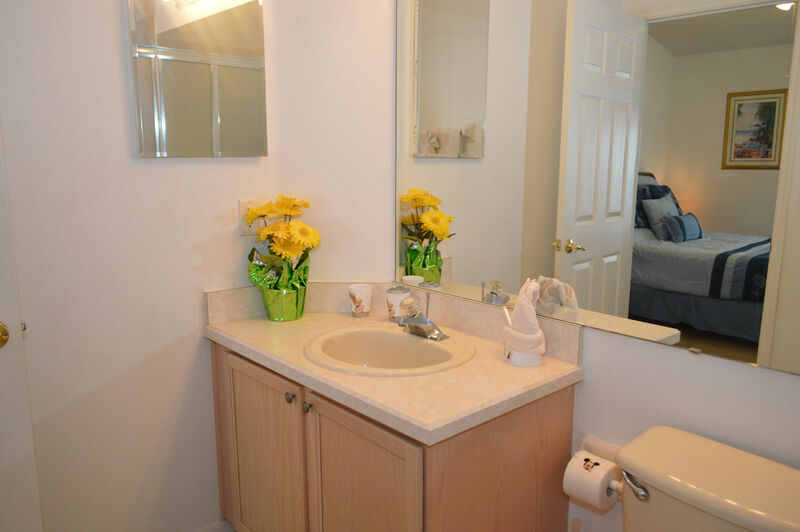 En-suite facilities consist of a walk-in shower, vanity unit and toilet. 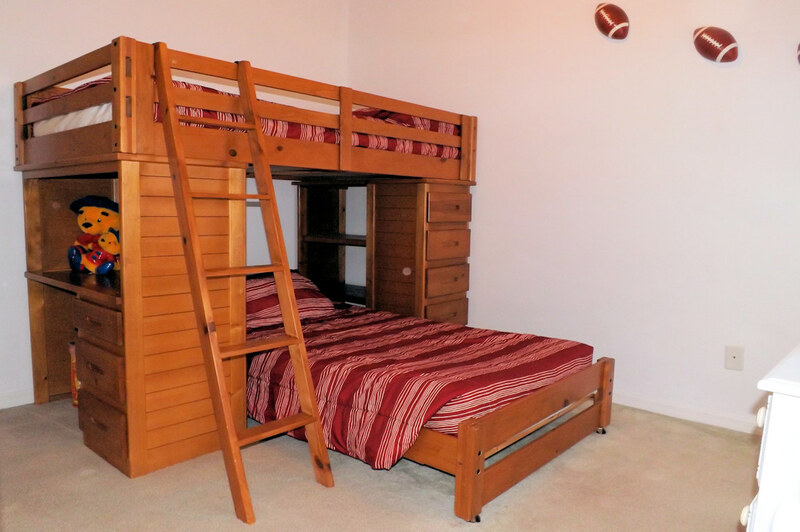 The third bedroom has a single (twin) bed with a bunk bed over and large walk-in closet. TV now 22" Flat-screen. 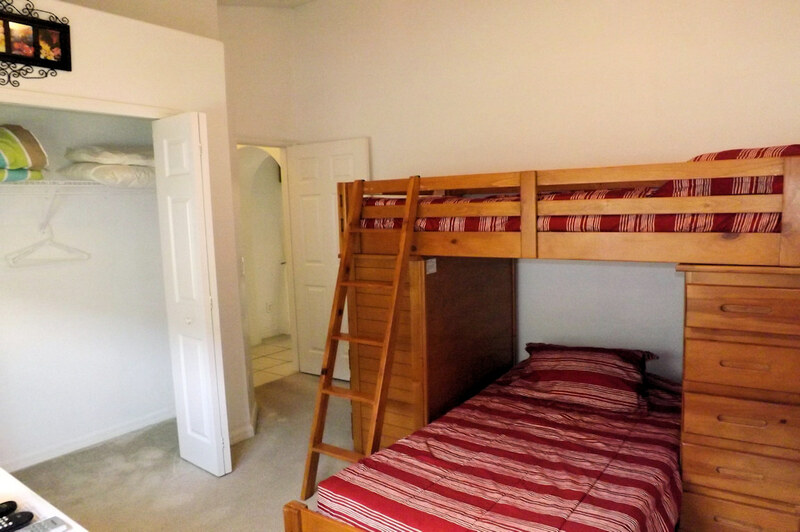 Bedroom four has twin beds and a large walk-in closet. TV now 22" Flat-screen. 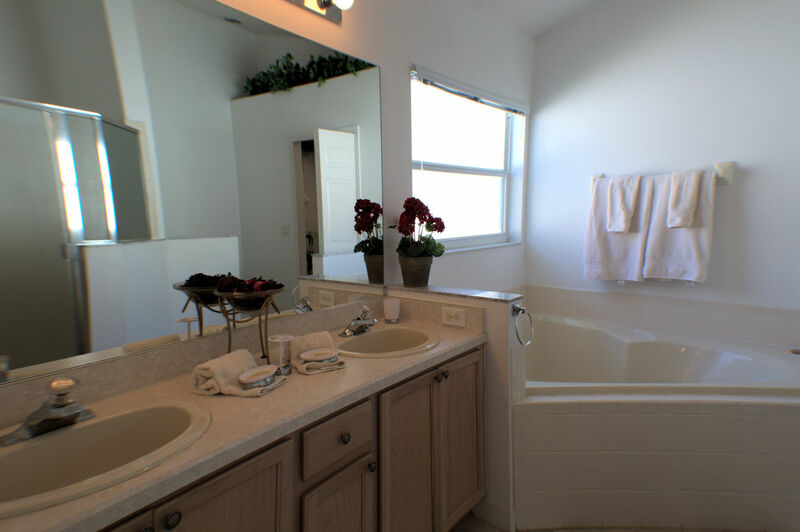 The family bathroom. 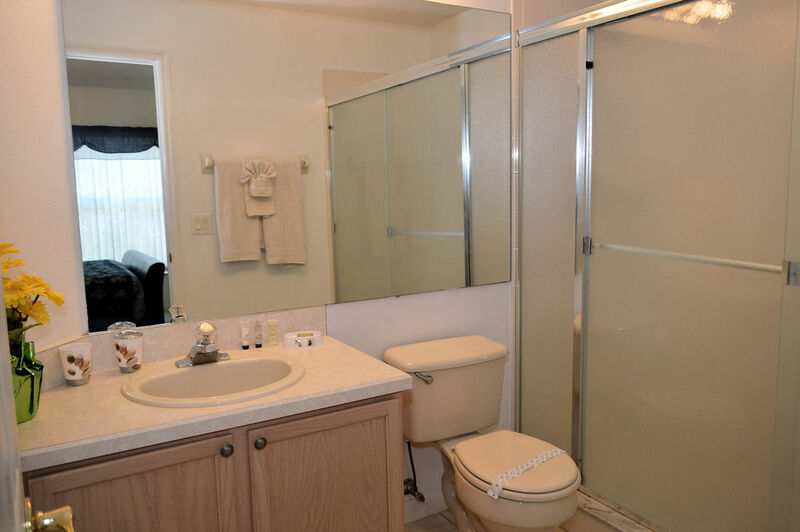 located between bedrooms three and four, is equipped with a bath with shower over, vanity unit and toilet. All bathrooms are supplied with hair dryers. 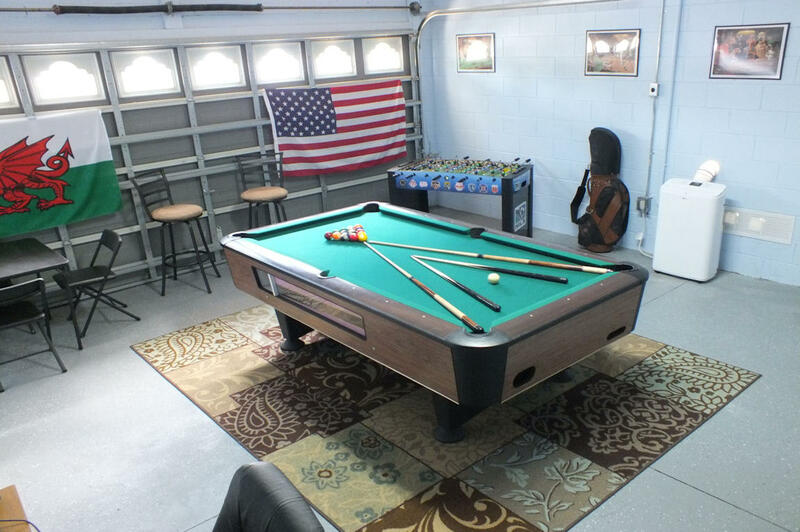 Our air-conditioned games room has a pool table, table football (foosball), electronic dart board, "Strike - You're Out!" 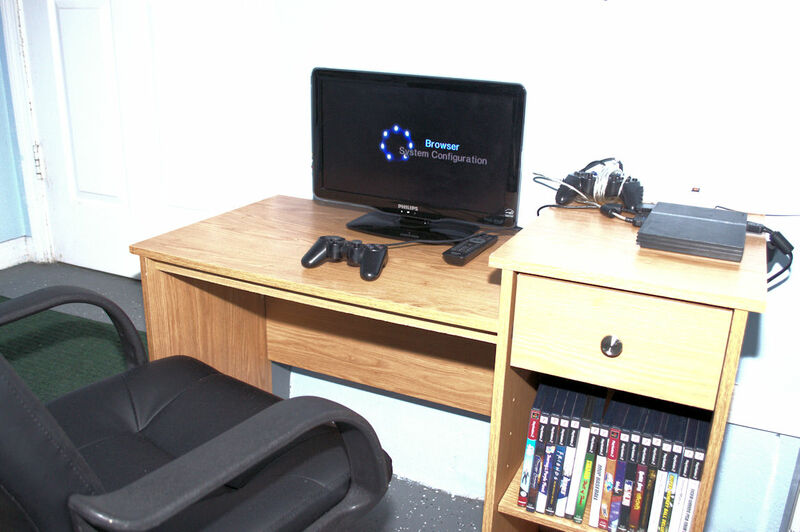 velcro tossing game, playstation/2 with two hand controllers and a selection of games, card table and 4 chairs, plus 2 bar stools to watch all the action! 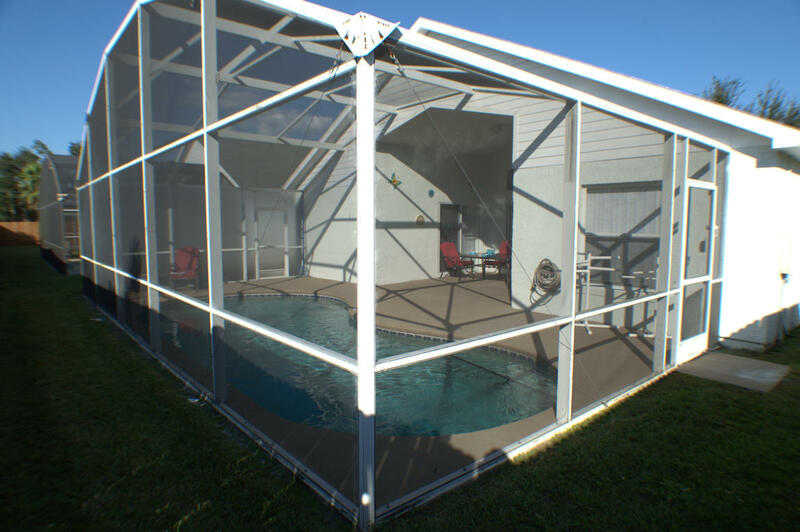 The pool area is screened with fine mesh to keep the bugs out and consists of a large shaded lanai, plus sun-bathing area. 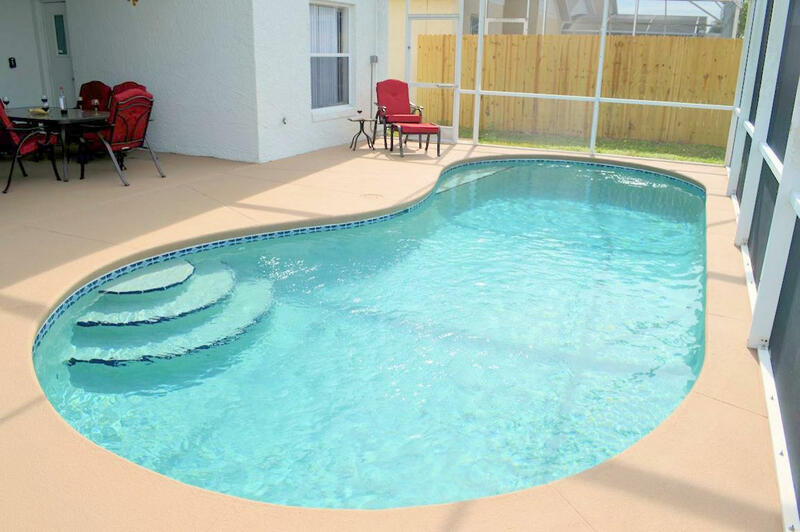 The curved pool has easy-access steps with varying pool depth (3 to 5 feet). The pool catches the sun from mid-morning through to the evening. 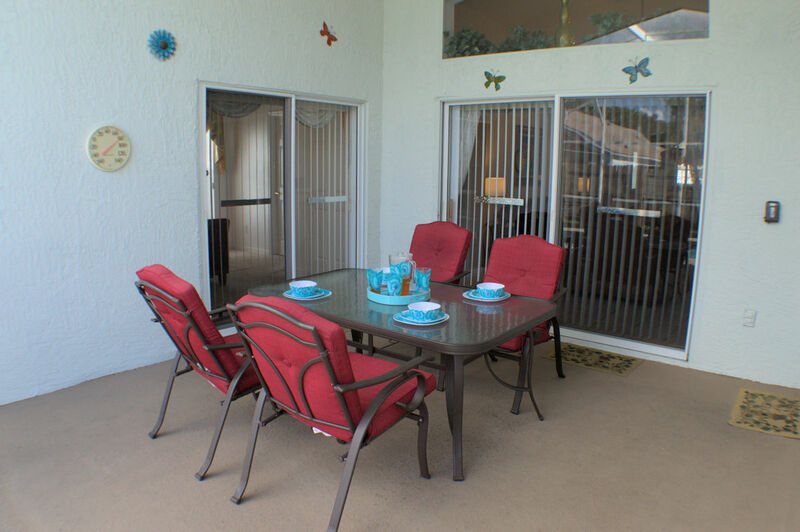 The patio is equipped with a table and six reclinable chairs, two foot stools and a side table. 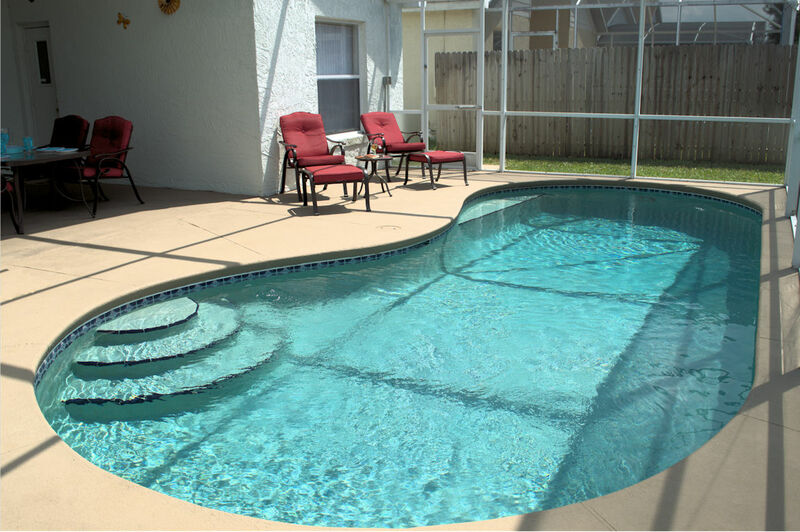 Optional pool heating is available for the cooler months. For child safety, all access to the pool area is protected by door alarms. Secured, high-speed (up to 100mbps) Wi-Fi internet access is available throughout the villa - including the lanai/patio area. Telephone calls within the US, Canada, Mexico and Puerto Rico are free. 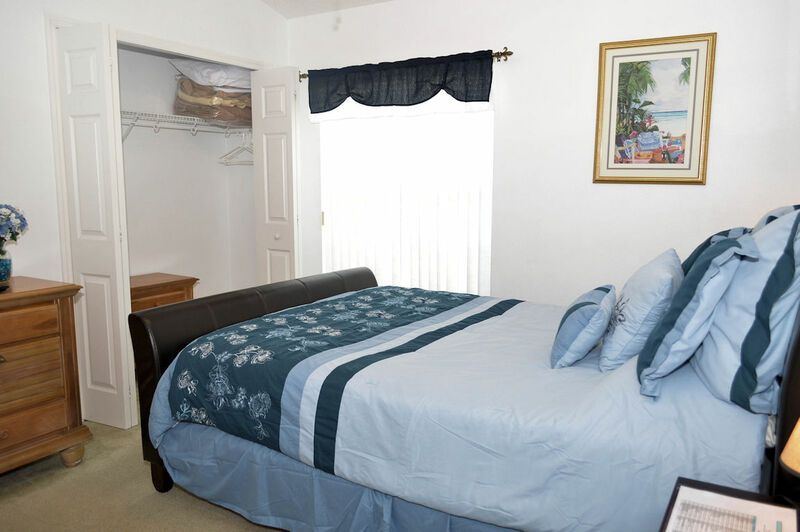 The villa is equipped with a washer and dryer, iron and ironing board. A travel cot (crib), high-chair, two pushchairs and a three car booster seats are also available for our younger guests, free of charge. Sets of Ladies, Gents and Youth Golf Clubs are also available for your use. 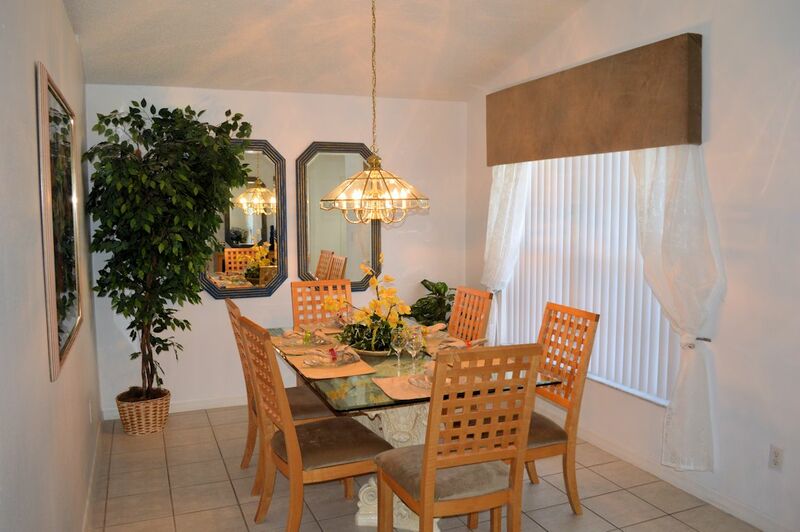 “We have just returned from a holiday of a lifetime at this fantastic villa based in Indian Point, Kissimmee. The owner provided us with clear instructions of how to get to the Villa from the airport and entry to the premises was easy. 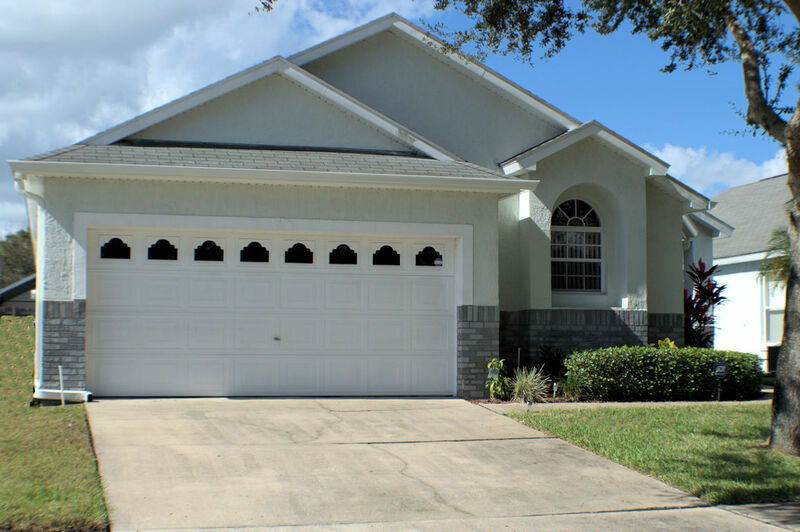 The Villa is in a lovely neighbourhood, close to most of the Disney Parks and with lots of choice of places to eat within a few minutes drive. The Villa was spotlessly clean, spacious and comfortable and the pool was cleaned regularly during the 2 weeks we were there. 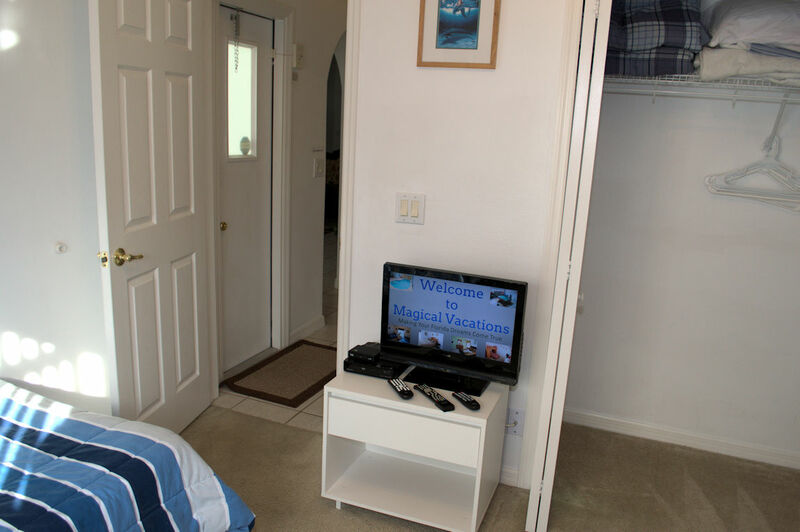 There is plenty to do in the Villa with the games room, outside pool, cable tv and DVD. The 2 weeks absolutely flew by and we were all sad to have to leave. 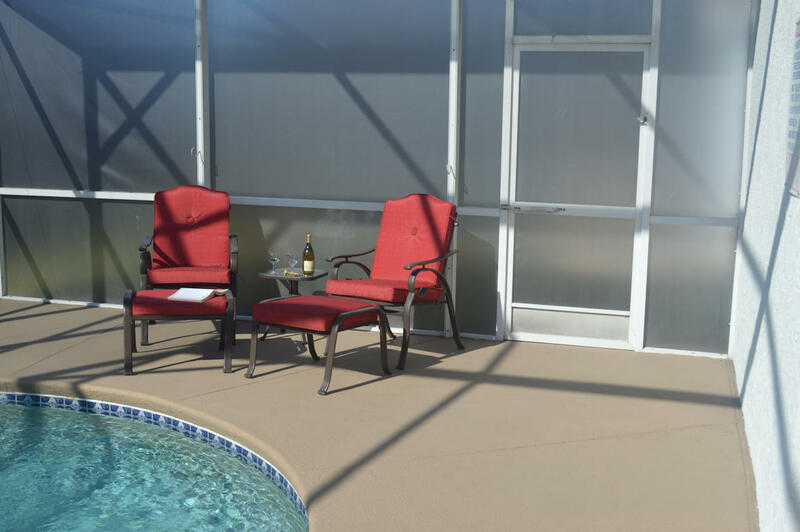 Would strongly recommend as a holiday accommodation and will definitely be returning when we next holiday in Florida.” – Adrian & Family (Newport, South Wales, UK). “We were so pleased when we arrived at the Villa, everything ran so smoothly and all was as laid out as described, the location was fantastic and the Villa spotless and spacious, the kids loved having their own bedrooms. The pool was fantastic and plenty warm enough without the heater I just wish we had time to use it more as we were so tired on the evenings we were all happy to chill and enjoy the dvd collection, we didn't even get chance to use the game room. Many thanks from myself and my family we felt so at home and will thoroughly recommend the Villa to friends and family looking to visit, it was exceptional value, so once again a big thank you.” - Chris & Family (Bristol, UK). “We just got back from a fantastic two weeks in Florida. 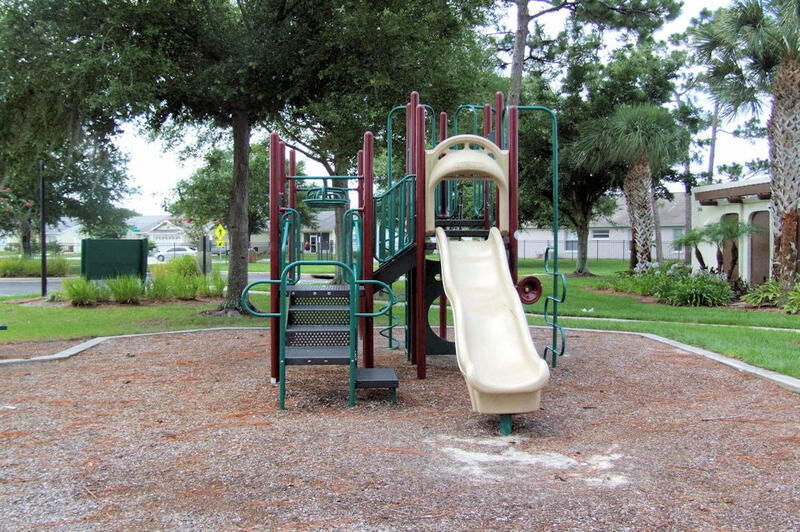 The villa is in a nice neighbourhood and well located for the parks, which are only a short drive away. It was spotless and plenty big enough for 7 people, with everything we needed, including a great pool for cooling off in the afternoon. Overall a great base for our trip.” - Helen & Family (Gloucester, UK). “The area was so quiet. Everything was nice and clean. It was a beautiful place. Everything you need is close by. Minutes away from shopping and family fun. Beds were very comfortable.. 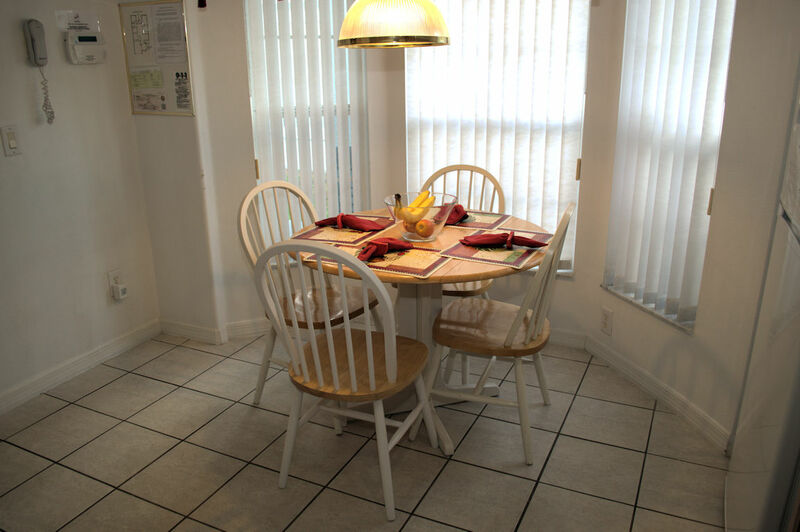 I will definitely be back to stay there again.” - Monica & Family (USA). 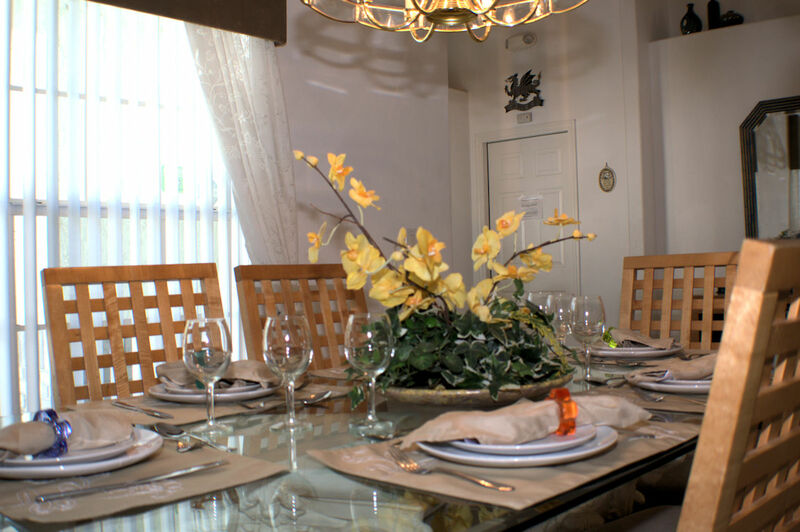 “Excellent Experience - This villa was perfect and had everything we needed for it be a home away from home. 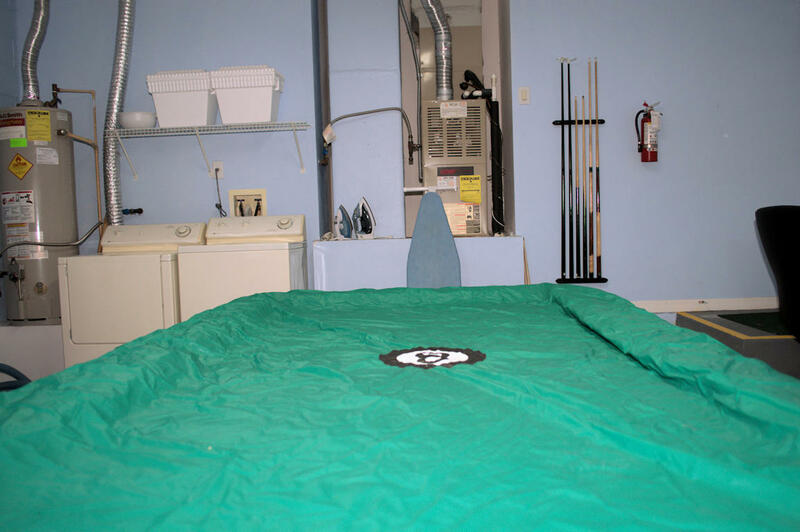 No complaints what so ever and I definitely recommend this to family and friends and plan to use this place every time I return to the area.” - Takia & Family (Maryland, USA). “Arrival was really straight forward with no keys to collect. Prior to arrival communication from the owners had been great and they were really helpful with directions. 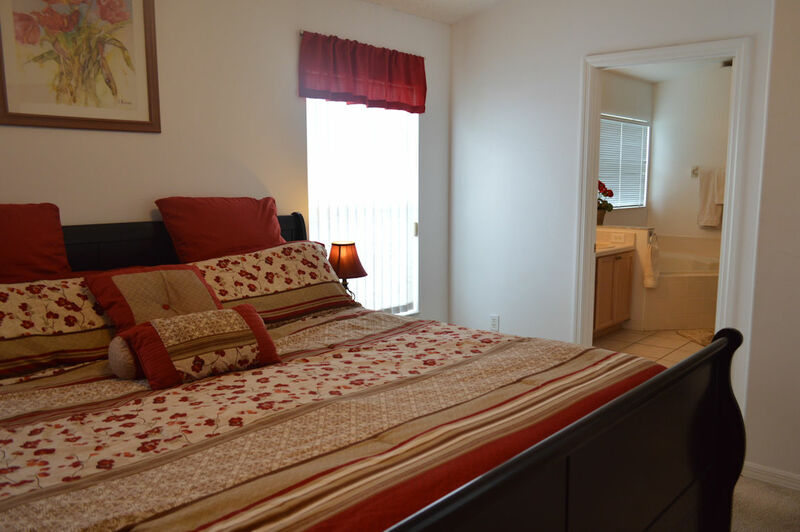 The location is ideal just around the corner from a big Walmart where you can get everything you need and about 20-30 mins to the major theme parks. It was really spacious with more than enough room for the 5 of us that went (4 adults 1 child). 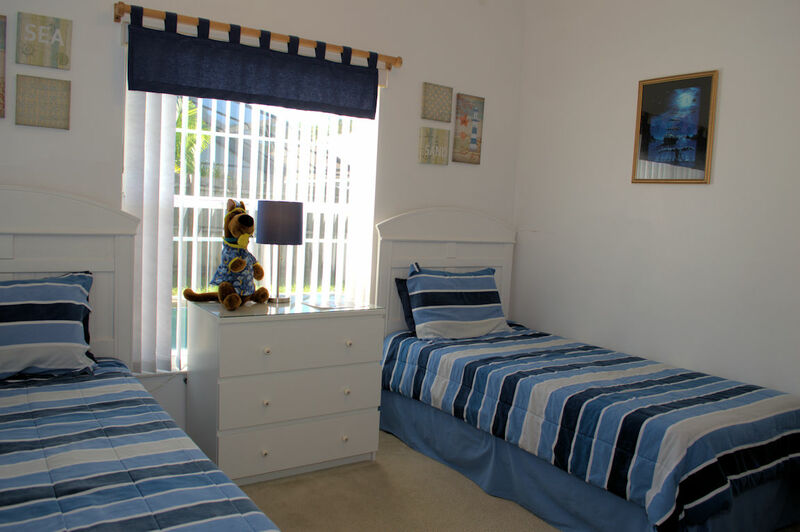 We would definitely stay here again.” - Felicity & Family (UK). 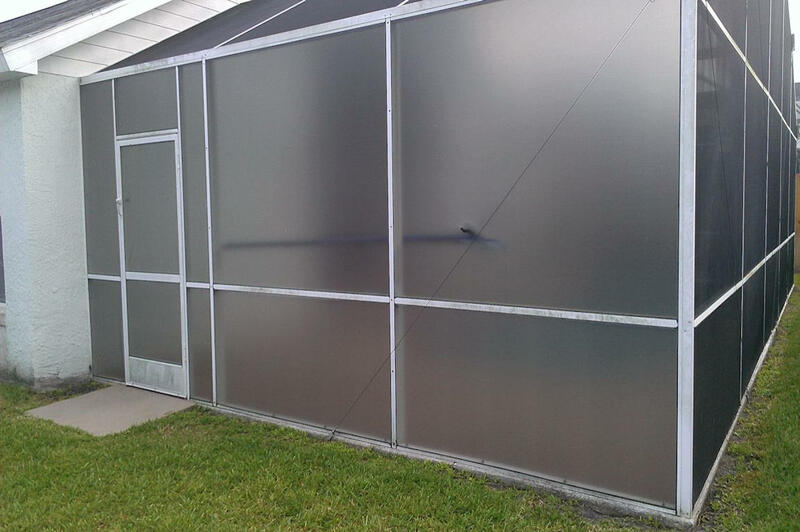 “Fantastic home, very spacious and exactly as pictured. It was clean and modern, a true home away from home. Plenty of space for the whole family, the kids loved having their own TV's. A great private pool with very comfy outdoor furniture. Very easy to access, no need to drive to an alternative location to pick up the key. Ideal location, 24 hour Walmart just around the corner, along with many restaurants we were spoilt for choice! 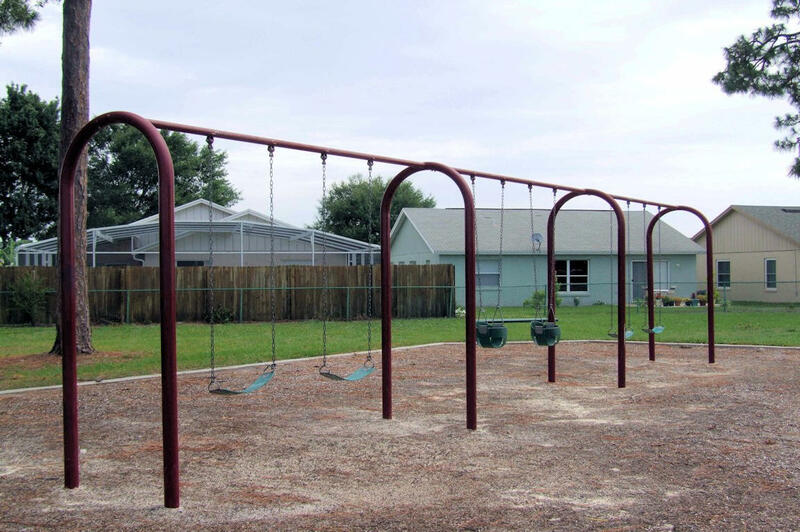 All of the attractions were also very close to the home. Can't wait to come back and enjoy your beautiful home again, have already recommended it to many friends!” – Rafael & Family (Campinas, Spain). “We all loved the villa. It was in a great location easy to get to all the shops and stores. Not far from all the parks, it really was a home away from home. Looking forward to renting again next year.” - Brooke and Family (Akwesasne, QC, Canada). "Just returned home from a week in London following Florida. Your villa was amazing and an ideal base to everywhere. Totally loved it. Thank you so much." - Sharon and Michael (UK). "We stayed in your Villa over Christmas & it was absolutely wonderful.The villa is in a great location & the area is very quiet & feels very safe......none of us had been to the US before, so we weren't sure what to expect. 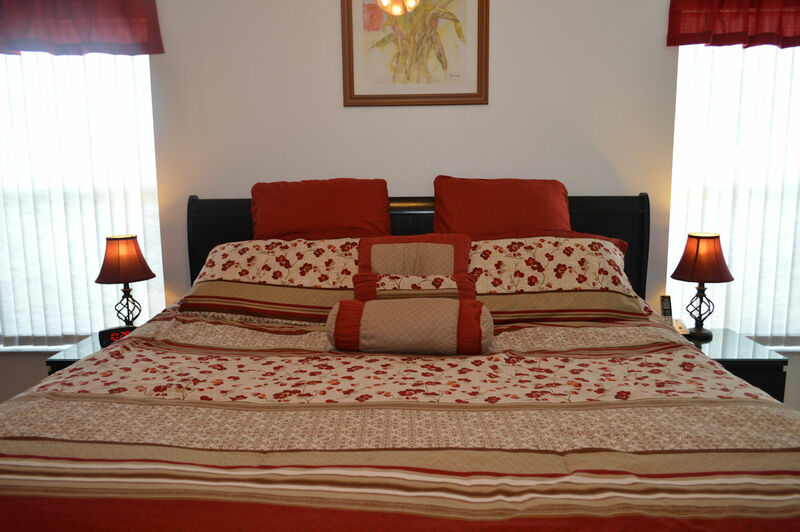 The facilities are excellent throughout & everything is very tastefully decorated, modern,spacious & immaculately clean. We made a mistake in not paying for the pool to be heated.......we definitely should have got more use out of it, but we'll know for next time. We have stayed in some very good accommodation over the the years, but this was right up there with the best & one of the great things about it was that we all felt at home immediately from the moment we walked through the front door on arriving. Thank you both, you have a wonderful place here, that you should be very proud of....I'm sure that you are!" - Brian, Carol and Family (UK). "Can I just say to you both that you have an absolutely lovely second home, beautifully decorated with everything anyone could ever need and I am immensely enjoying spending time here, my husband arrives soon and I know he will love it too, its been so great having the internet here, as he and I can skype all the time, please be assured we will take great care of your wonderful home." - Rita (Brigg, North Lincs, UK). "Thanks for the rental of your villa. We had a fantastic time, and your house was great! We did not want to leave! Now that my wife has been to Florida I have finally convinced her to move there! Some of my family that live in Cape Coral also loved the house and have taken some of your cards to give to relatives for their information. Once again thanks, you have a beautiful house." - Paul, Nicole and family (Suffolk, UK). "Thanks for opening your home to us. We had a wonderfull time. The house was very nice and well laid out. It was very accommodating and served us well. 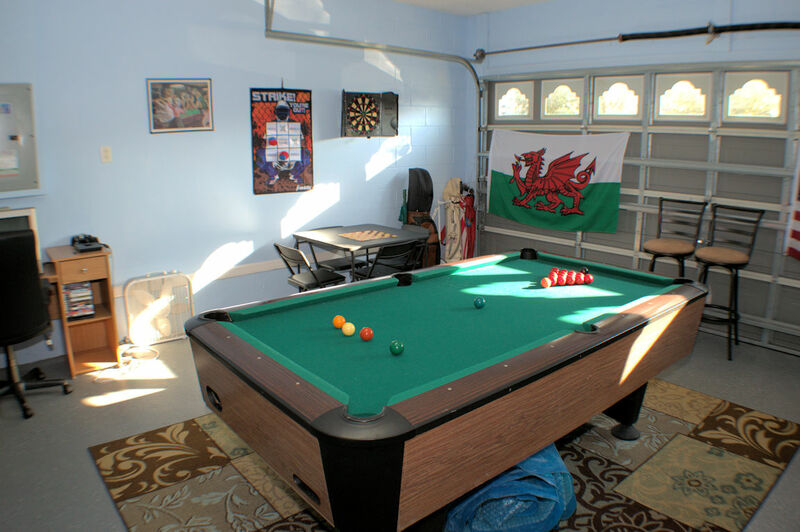 The games room was a nice touch. I would bet we played over 150 games of pool during our stay! We had a ton of fun fishing on lake Toho. We rented a bass boat and caught some bass, pike and a 10 pound catfish! We had some nice dinners around Kissimmee, our favorite spot was Chef Johns in the old downtown. The Blackened grouper was excellent! We strolled down to Abracadabra Creamery and had some awesome ice-cream afterwards. We were stuffed at a reasonable price. 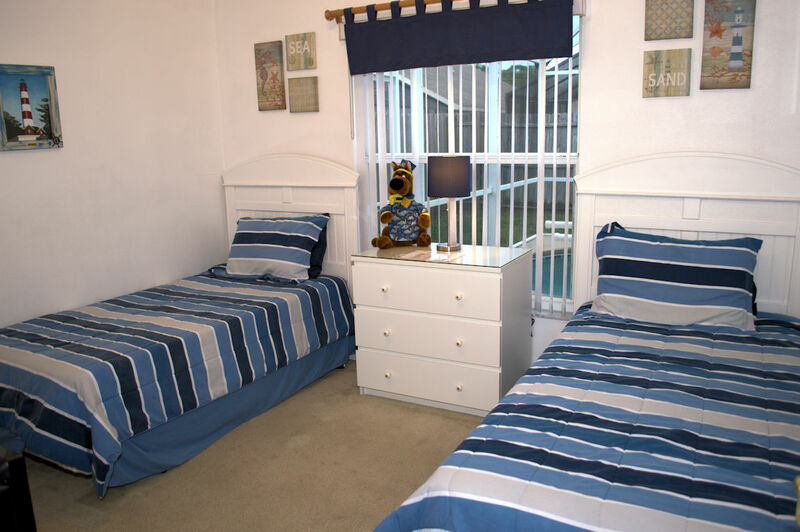 We enjoyed our stay and we would recommend it to others that were looking for a place close to Disney. All the best" - David, Deirdre, family and friends (Ontario, Canada). "To say that we didn't want to move from your villa is an understatement! It is absolutely beautiful - a real 'home from home' place. We really can't put into words how delighted we were with it - it's roomy, bright and catered for us all. There is no doubt at all that if/when we return to Florida in the future we will definitely be contacting you." - Lee, Kevin and family (Birmingham, UK).